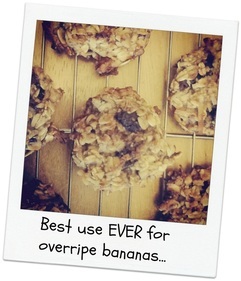 These healthy cookies are low in fat and sugar, high in fiber and gluten-free! Best eaten warm, straight from the oven. They also make a healthy and delicious breakfast you can eat on the go. 4 Ingredients + 14 minutes = infinite pleasure in Chocolate Heaven. No one has to know how easy it was! Combine the first 3 ingredients in a medium mixing bowl. Drop spoonfuls onto a baking sheet sprayed with cooking oil and bake at 350 for 6-9 minutes. Take sheet out of the oven and immediately top each cookie with an unwrapped Andes mint. Allow to sit undisturbed for about 5 minutes. Then take the back of a spoon or an offset spatula and smear the melted chocolate over the top of the cookie like frosting. Allow to set up before serving. Yum! Wow your guests with this simply delicious and refreshing dessert that's as easy to make as it will be on your waistline. It can be made ahead of time and frozen. Allow time to thaw slightly before serving. Place the frozen pineapple in a food processor fitted with a chopping blade and process just until it begins to look grainy. Add both yogurts and continue to process until smooth, stopping occasionally to scrape the sides of the bowl. Tip: Try substituting frozen mango and peach yogurt for another tasty alternative!